Two years ago a CASA volunteer, Mark* was assigned to a youth named Adam* age 16. Adam was experiencing self-harm, depression, had suicidal ideation, suffered a near drug overdose, and had run away. Adam had been detained from his parent’s custody due to the parent’s own mental health concerns going untreated. At that time, he said he felt his parent was too mentally unstable to take care of him. Unfortunately, he was never able to reunify with his parent. Adam remained in the permanent plan of long term foster care called Permanent Planned Living Arrangement (PPLA). Fast forward to today. Adam has now reached majority, and is transitioning into a young adult and participating in the Assembly Bill 12 Program which offers him mentorship and support. When Mark was first assigned to Adam, his social worker, described Adam as dressing in a somewhat “emo” style (colorful hair, piercings, etc.) When Mark met Adam he noted his flat affect (would not look people in the eye, but look down), seemed extremely sad, wore long sleeve shirts that covered up scars on his arms from cutting and did not care much about school. His case appeared to be challenging. However, Mark was never put off by Adam. In fact, he immediately reached out to Adam and was able to advocate for Adam’s best interests while being flexible with how Adam preferred to mainly communicate through text messaging. Mark advocated for Adam in his school setting and to improve his grades. He recommended mental health services for Adam. Mark’s caring and commitment to Adam were instrumental in helping Adam “reach for the stars”! During this past year Adam has matured in various ways. He no longer seems sad, carries himself with a smile, and appreciates all that is done for him by his social worker, his foster parents and Mark, his CASA volunteer. Most importantly, he has grown into a young adult with a good future. In high school, he participated in sports; where his coach taught him good sportsmanship. As an athlete, he was accountable for his academics. He learned to make meaningful connections with his peers and team-mates. He has also learned to advocate for himself. Once he asked the Juvenile Dependency Court judge if he could seek employment, which the Court supported as long as he was able to maintain school academics and schoolwork while working part-time at a restaurant. Adam worked hard to develop coping skills and continued to maintain on psychotropic medication. Throughout the time Mark advocated for Adam, he sometimes felt that his relationship with him seemed distant. Adam would often text Mark instead of speaking to him in person, and Mark feared that once Adam turned 18 he would not want Mark to continue on as a CASA Mentor. However, this past month while at a court hearing, Adam told the judge he definitely wanted Mark to continue to be his advocate. Adam thanked his social worker, his foster parents, and Mark for being supportive. Mark was over joyed and pleasantly surprised to hear that Adam wanted him to continue on as a CASA Mentor. Mark now helps Adam as his CASA Mentor as Adam transitions into being a responsible and productive young adult. Must! Charities is rooted in four areas: Collaboration, Accountability, Comprehensive Change and Sustainability. The 2017 Annual Report highlights how those areas drive the results-oriented approach to project collaboration. Review the organization’s financials, project impacts, and how the life of a project works. The entire report is available for download HERE. And, in just two years, by integrating this radically different approach into all parts of the school and rebuilding many of its practices from the inside out, suspensions plummeted more than 50% to just 8.4 percent of the student population in just two years. The program that the Park Middle School educators piggybacked on in Fall 2015 was the Sanctuary Model, a trauma-informed method for changing organizational culture from one that is toxic to one that is healthy. Jimno and a group of teachers and administrators participated in monthly county-wide “train the trainers” workshops where they learned how to integrate the model into their school; then they trained the rest of their staff. 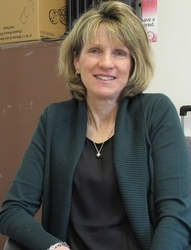 The model, developed by Dr. Sandra Bloom, a psychiatrist and assistant professor of Health Management and Policy at the School of Public Health at Drexel University in Philadelphia, has been implemented by hundreds of organizations and communities across the U.S., including public and private schools, health organizations, residential treatment centers, domestic violence shelters, and drug and alcohol treatment centers. The Sanctuary Institute has been teaching the model since 2005; integrating it into an organization takes at least three years. The Sanctuary Model is similar to a small group of organizations — including CLEAR (Collaborative Learning for Educational Achievement and Resilience), Turnaround for Children, Compassionate Schools, and HEARTS (Healthy Environments and Response to Trauma in Schools) — that teach a trauma-informed, whole-school approach based on the science of adverse childhood experiences. “Adverse childhood experiences” comes from the landmark CDC/Kaiser Permanente Adverse Childhood Experiences (ACE) Study, which showed the link between 10 types of childhood trauma and the adult onset of chronic disease, mental illness, violence and being a victim of violence. Those traumas include living in a household where a family member has mental illness or substance use problems, or where parents have divorced or there’s been emotional or sexual abuse. Subsequent ACE surveys include racism, witnessing violence outside the home, bullying, losing a parent to deportation, living in an unsafe neighborhood, and involvement with the foster care system. Other types of childhood adversity can also include being homeless, living in a war zone, being an immigrant, moving many times, and attending a school that enforces a zero-tolerance discipline policy. The ACE Study found that most people (64%) have at least one ACE; 12% of the population has an ACE score of 4. Having an ACE score of 4 nearly doubles the risk of heart disease and cancer. It increases the likelihood of becoming an alcoholic by 700 percent and the risk of attempted suicide by 1200 percent. Using tools from the training with her students, Buckley has been able to make new inroads in building trust. “I have a girl in class. When she’s angry, she will burst out cussing. She will walk out of class,” says Buckley. The student is also frequently tardy. So, Buckley talked with the girl and found out her anger stems from her not being able to live with her mother, who struggles with drug use, and having to live with another relative instead. Buckley acknowledged the student’s anger, but gently pressed upon her that she had to find another way to deal with it. “So, I said, ok, what’s your plan when you’re angry? Because you can’t be cussing like that in the middle of a classroom, in a library, in a courtroom, or anywhere. It doesn’t work.” The girl came up with a plan that if she’s triggered, she’ll step outside the classroom until she calms down, explains Buckley. The Sanctuary Model puts as much emphasis on teacher and staff self-care as on caring for students. Sometimes teachers need more than a moment in their class. They need to step away. So, they have a “buddy system.” “I can call up Mr. Jimno and say I need a few minutes, could you take over my class?” says Buckley. Or if there are students who are pressing a teacher’s buttons, they may be asked to sit in the back of a “buddy” teacher’s class. 7th grade teacher Johri Leonard says he often takes in those students who sit at the back of his classroom and calm down. The ability of students and teachers to pay attention to what triggers them and pause and reflect before they react didn’t just happen. 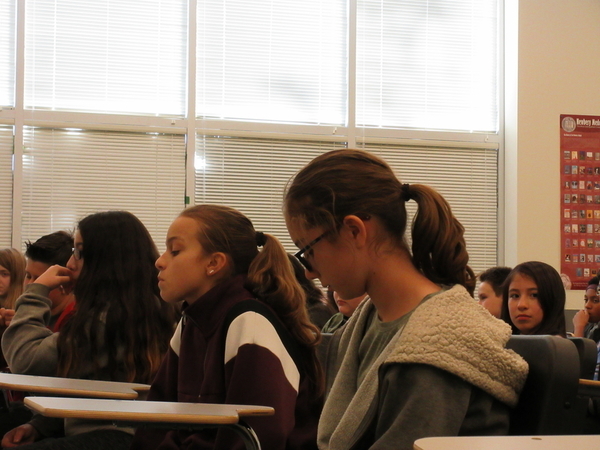 It has been made easier by a rich array of new practices — including mindfulness meditation, a staffed wellness center, individual student check-ins, restorative meetings after tangles between students, or students and teachers, teacher safety plans, and yoga — that have been embedded in the school culture to help students and teachers. Many of the students at Park need more than mindful moments. If triggered, they can visit the wellness room housed in a modular structure. It’s carpeted in grey, and lavender permeates the room from a diffuser. 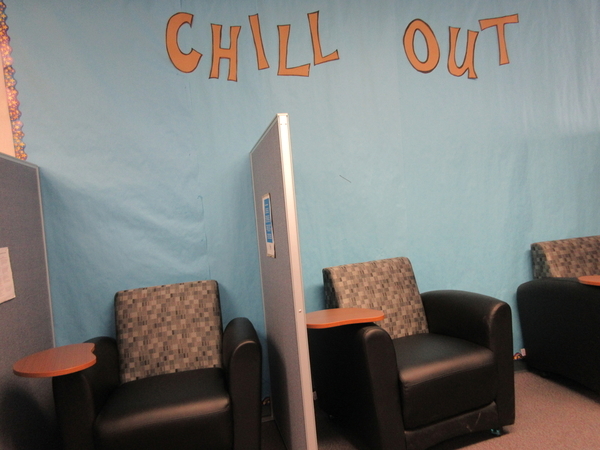 The room has a “talk” area, a “chill out” area with comfy black armchairs separated by dividers, and an open area for yoga poses. The room is staffed by Mish Guker, a wellness counselor, and Katie Byram, a marriage and family therapy and school-counseling intern from St. Mary’s College, who sees students individually and in support groups. Here they can curl up under a weighted blanket or cuddle a weighted stuffed animal, listen to mindfulness music, squeeze stress balls, zone out on iridescent water-filled wands, or just sit quietly and take deep breaths. There’s a 10-minute limit to visits, so the students don’t miss class. If they need more time with a counselor or psychologist, the counselor will set up a longer appointment, says Jimno. Before there was a wellness room, “I would get in trouble a lot of time because there was nothing that I could do with my anger in a healthy way,” he says. 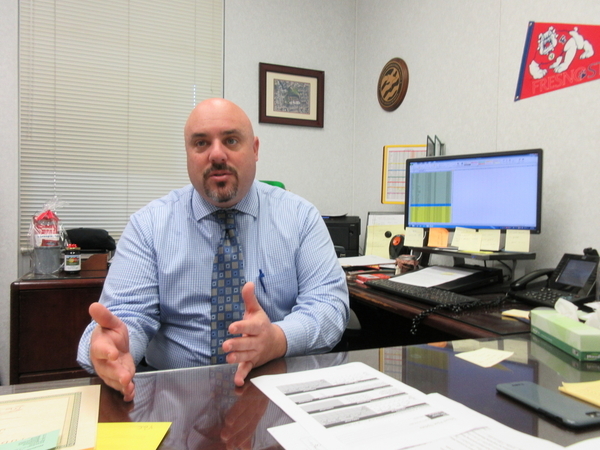 Since Park Middle School has shifted to trauma-informed practices, suspensions have been reduced overall, but it’s a system that Jimno says will need to be tweaked and fine-tuned. 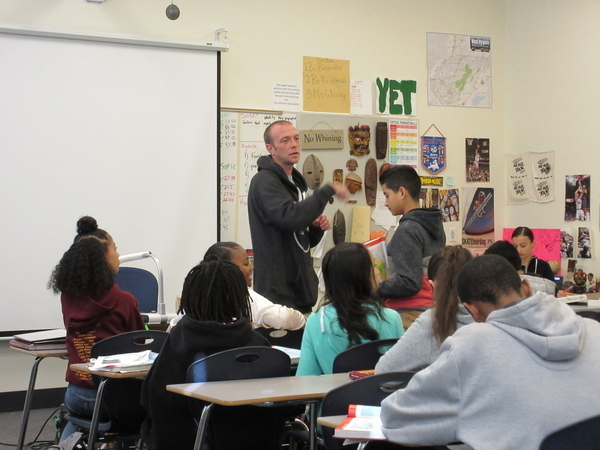 He cites this example to explain his reasoning: Over the last several months, about 39 new students, many of them 8thgraders, came from other schools and were unfamiliar with and resistant to the trauma-informed practices culture, he explains. “There were a few weeks where there was one event after another,” he says. Students were getting into fights in the quad. Teachers were being tapped out. Suspensions rose sharply. One of the solutions was hiring a teacher to work with some of the students who needed closer attention in a smaller classroom. Another was one-on-one meetings with several students who were regularly showing up late to class and torpedoing the flow. In one case, the student’s P.E. class was changed to provide her more time to change out of gym clothes so she could get to her next class on time. Things have quieted down now, he says. But he’s working to obtain grants to keep the staffing in place at the wellness room and expand what he can offer to keep trauma-informed practices embedded at the school. For this young man, a check-in with a trusted adult is not just a casual request; it’s what’s helped him be able to stay at the school, says Jimno. “At the beginning of last year, we didn’t know if he would survive in this school,” says Jimno. “He had a ton of disruptive behaviors, a lot of removal from class, a lot of conflicts with a lot of kids at lunch.” About 42 students currently have daily check-ins to help keep them on track academically or help them cope with behavioral or mental health challenges.